There are many wonderful benefits that come from working with young children. You get to watch them make new discoveries every day and can encourage a love of learning and adventure that can set them up for a lifetime enriched by these positive behaviors. However, if you work with young children, you've probably also had to deal with one of the not-so-fun components of this profession: toddler tantrums. They're loud, they're frustrating and, honestly, they're pretty unavoidable at this age. But luckily, there are things that you can do to mitigate these fits and discourage them in the future. When a child begins to show the signs of an oncoming tantrum, the first step is to stay calm. With a few preventive measures, you can avoid a full-blown screaming match. Start by taking control of the situation. Remember - you're the adult here! Jo Frost, a global parenting expert, told Reader's Digest that the key to preventing tantrums is assertiveness, so try to intercede before things get out of hand. Keep your cool and ask the child what's wrong. When toddlers throw fits, often all they really want is to be heard. Kneeling down to their eye level and beginning a calm conversation may be all you need to do. 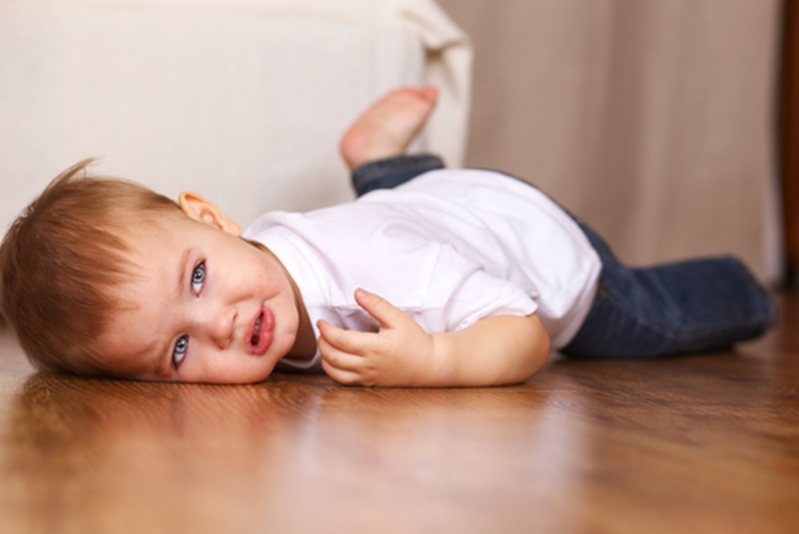 Temper tantrums are common among toddlers, but that doesn't make them any more enjoyable for caregivers. Sometimes, you'll see the signs but will be unable to head off the tantrum. When that happens, take a deep breath. Remember, you can't control the behavior of the child, but you can control how you react. And keeping your cool and speaking reasonably to the toddler may be all it takes to turn things around. Try humor: Sometimes being silly can go a long way toward diffusing tantrums. A little bit of humor may turn those shrieks into giggles. Use distraction: When children throw tantrums, they're usually about specific problems, perhaps toys that they want from other children. When that happens, distracting kids with a different toy or suggesting a trip to the playground may make them forget whatever it is that they're upset about. Take a time-out: If things start to spiral out of control, you may be the one who needs a timeout to collect your thoughts. Make sure that the child is in a secure location and then turn around or close your eyes and slowly count to 10, breathing slowly in and out. Then try talking the problem out again. Sometimes, ignoring the tantrum is most effective to let children know they won't get the attention they seek from the behavior. Though it may be tempting, don't give into any demands that the child makes. This will just send the message that throwing a fit is an effective strategy that should regularly. Discourage the behavior by staying firm and refusing to cave. If you really want to discourage tantrums in the future, keep in mind that children mimic the behavior they see. So if you raise your voice or argue back, they are likely to continue their own negative behavior both during the fit and at a later date. When the whining starts, parenting educator Andrea Nair told The Huffington Post that she recommends using phrases such as, "I can hear you when you use your normal talking voice" or "Sure, we can do that when you ask me with your normal voice. I'll wait." Remember, a child's tantrum is not a personal attack, so you shouldn't take it to heart. Keep a clear head, remain calm, and encourage communication. Ready to learn more about about creating a safe and calm classroom for toddlers? Consider enrolling in an early childhood education course from ProSolutions Training today.